RapReviews.com Feature for December 9, 2003 - Ugly Duckling's "Taste the Secret"
For years now Ugly Duckling have spread the myth of how they first met. As the story goes, they all worked at the same Long Beach fast food joint called MeatShake, which supposedly served shredded meat mixed with milk, filled up in styrofoam cups for extra easy access to all those vein-clogging fats. When I first heard them spin that tale in an interview in 2001, I probably didn't know what to make of it. Two years later, coincidentally coming across that interview again, it reminded me of an album our site just has to squeeze in before the year ends, even if it's been out for about a half a year. 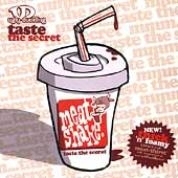 Listening to "Taste the Secret" now, I'm as unsure about whether this MeatShake place ever existed or not as I've ever been. After all, it doesn't seem that absurd for a country that likes to think that any excess is a sign of the system working. And meat shakes surely are as excessive as the idea of fast food is ever likely to get. Yet as convincing as their promotional website, meatshake.com looks, I'm inclined to call it a spoof, arguably one that has been long planned and well executed. Call it a concept album, but it really isn't one, just an album with a carefully crafted subplot about a fast food chain called MeatShake that serves everything with meat. It's the exact oppposite of the joint across the street, arch-rival Veggie Hut. On the handful of tracks and skits that deal with this strange business venture, Ugly Duckling present some of the best comedy ever heard on a rap record, period. Like any great parody, the subject (our eating habits) is essential, but the satire also points towards the greater depths of human insanity. Hey, you don't need steak, get a MeatShake! Hey, for Pete's sake, get a MeatShake! and you're a cheapskate, so get a MeatShake! they want a good meal, they don't wanna join your cult." dull and unattractive, living like a fat kid." who 'follow where the Light goes' wearing little tight clothes." She: "Good, release that anger, I see you're too uptight. Come and get a bran muffin." He: "Yeah, not on your life. Your food is too expensive and I wouldn't even get full." She: "Can you put a price on your body and your soul?" He: "Look, I'll keep eating meat and you do what you do." She: "Tell me what an animal has ever done to you?" He: "It filled me up." She: "...with blood and guts." He: "Hey, save the attack." She: "I guess I just respect life." He: "I have it for a snack." Later on, the beef (excuse the pun) between the two rivalling businesses escalates, when protesters lead by the Veggie Hut lady threaten to burn MeatShake down to a crisp. It's absolutely hilarious. While these tracks are easily the most memorable, there's more to discover on "Taste the Secret". And that's where the perception of Ugly Duckling begins to depend not so much on the listener's humor but on his mood and musical taste. Feelgood songs with a simple message and no profanity have a hard time in hip-hop, and even though Ugly Duckling may be closer to rap music's roots than almost any of their peers, their good-natured rhymes and fun beats have usually something goofy about them that makes it hard to take them serious as a hip-hop act. "Turn it Up" and "Energy Drink" may be based on concepts (which is more than can be expected from most rap tracks), but they are executed so utterly and completely simplistic that you seriously start to wonder if they're part of a joke inspired by another song on this album, "Dumb it Down". "Dumb it Down", again a rather simple ditty, exposes the trend towards the lowest common denominator in human interaction. "If you're smart then you better start dumbin' it down" is a line Jay-Z would probably co-sign (see "Moment of Clarity"), but rather than apply it to their own situation as rappers, they keep the song's meaning as general as possible. That doesn't mean that Ugly Duckling don't have anything to say about the state of the hip-hop nation. "Mr. Tough Guy" partially refers to hip-hoppers when they rhyme: ""Hip-hop's not about seemin' tough / grabbin' on your crotch and screamin' 'What!' / Really, I think we've seen enough." "La Revolucion" is set out in the Mexican desert, with Andy playing the desperado tired of hiding in the underground trying to start a revolution. "Potty Mouth" finally is their most open comment on the state of the art. While not quite in the league of Heavy D's classic "Don't Curse", they make some very strong points against profanity, rounding their arguments off with a lot of nice little breaks and quotes and hooks as usual. With its wealth of detail, the self-produced "Taste the Secret" (with assistance from Greg Koller in the sketches) fends off any notion of Ugly Duckling being limited in their expression. These guys know exactly what they're doing, and they're doing it extremely well. DJ Young Einstein builds groovy tracks from freshly unearthed samples, molding them into mostly upbeat, quirky party crashers. But they can also cool it down, to the point where they will close "Taste the Secret" with a genuine rap lullaby, the smooth-as-silk "Goodnight Now". Ugly Duckling's odd mixture of simplicity and professionalism might be irritating at first, but chances are that you will grow to appreciate the former once you're overtaken by the latter. Because even amidst seemingly irrelevant selections such as "Daisy", "Rio de Janeiro", "I Wanna Go Home", "Abigail Silk", or "Pass it On" (which all are equally revealing about Ugly Duckling's unique position in hip-hop), they're able to sneak in an absolutely essential contribution to hip-hop's eternal discussion about The Rap Game ("Opening Act"). Like fellow RapReviewer Damon Brown said recently on this site: "Simplicity, brevity and humility are usually underestimated in today's hyper-inflated rap world." It's only logical that Ugly Duckling, who - at least from a hip-hop point of view - excel at each one these qualities, suffer that same fate. Naturally, a lot of people are put off by Ugly Duckling's happy-go-lucky vibe. Even those who can appreciate the lighter side of hip-hop will miss a lot of what we used to find in acts like De La Soul, The Pharcyde, Black Sheep or Biz Markie. But at this very moment, on hip-hop's very own playground Andy C, Dizzy Dustin and Young Einstein are the undisputed kings of comedy, showing and proving that you can be wacky without being whack.